Canada started the tournament slowly with a shaky performance against Spain where they trailed 10-7 at the half. Canada were inflicting damage on themselves with turnover errors, a sure try negated with a failed last pass by Farella, Moleschi gifting a try to Spain with an errant pass inside the 5 metres. Was the curse of Kitakyushu 2018 striking again? That's when Canada failed to make the Cup round and came out with 2 series points. They barely finished 4th in the series that year. The second half was better, the cavalry arrived, Karen Paquin, Charity Williams and Breanne Nicholas subbed on. Williams immediately had an impact and scorched a defender on the outside. Paquin was providing some much needed intensity to the defensive effort. It was her imposing presence in the front of the lineout which created the last try as it was Spain's turn to gift a try to Canada. Canada narrowly escaped with a 26-17 win. In other first round action the USA were looking ominous, they crushed England 43-7. Australia blanked China 47-0, NZ 43-0 over Japan. Second round action revealed changes in form, England rebounded to blank Ireland 31-0 and the wheels feel off the NZ victory bus. They drew with Russia and then were defeated by France. They barely made the Cup round with a 1-1-1 record. Canada faced China and were cruising to victory with 3 early tries then fell asleep on defence to allow China back in the match with 2 scores. It was a narrow 21-14 scoreline for Canada at the half. The defensive lapse was troubling considering the teams that were coming up. The subs came on again Britt Benn and Bianca Farella and Canada answered with 3 more tries, two of them by Farella. Canada allowed one last try for a 42-19 win. Newcomer Keyara Wardley scored her first try on the series but also exhibited some defensive frailties on China's first two tries. Karen Paquin also scored her first try since coming back to the 7s and there were no frailties in her game as she was imposing herself with confidence. The final round match was against Australia, and after looking at the common scores against opponents from Round one and two, Australia were looking the more on-form team. Canada hit early however with tries by Farella and Paquin, Australia answered with two of their own and it was 14-10 for Australia with 5 minutes left. It was all on Canada's shoulders now. The Australian kickoff didn't go 10 and Canada kept possession, patiently moving the ball downfield before Landry knocked the ball on. Four minutes left with an Australian scrum at their 22. Brittany Benn made a huge play tracking the outside runner one on one, making the tackle, getting back on her feet, winning the breakdown and the penalty. That was the BCRN turning point. Canada went on attack but were not able to break the stiff Australian defence, Benn put a grubber down that trickled to within inches of the goal line, Australia recovered but with support not there the ball carrier was isolated. Kaili Lukan reached over the fallen player picked the ball up and extended her arms to score the try. Canada had to defend for a minute but Australia eventually knocked the ball on for a satisfying Canada win. Canada now face Russia in the Cup QF already surpassing their 2018 effort at Kitakyushu. The big news is the return to the national 7s team of Karen Paquin. On her social media account she had this to say today. She hadn't really shown up in our story database since the 2017 World Cup. She did show up in the 2018 East and West XVs camps, attending the West camp. Mention of her was made last year in the Langford 7s article when reviewing the try scoring stats. She was 3rd highest try scorer for Canada at that time despite being away from the 7s program since 2016. Ghislaine Landry tops the list for Canada at 105 tries, Bianca Farella at 88 then comes Karen Paquin at 53. Those stats don't include this season. Having someone of Karen's presence and try scoring ability back on the pitch will be a big boost for the program. 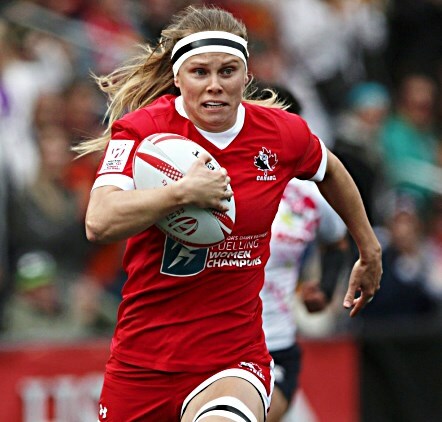 LANGFORD, BC (April 8, 2019) – National Senior Women’s Sevens head coach John Tait has named his roster that will travel to Kitakyushu, Japan for the fourth stop on the HSBC World Rugby Women’s Sevens Series on April 20-21st, 2019. Canada is coming off a fifth-place finish in Sydney and are currently tied for third with Australia. Last year saw a disappointing performance in Kitakyushu for the team, finishing outside the top eight—the only time doing so in their history. Canada will be gunning for a podium finish that would put them in good position to claim a ticket to Tokyo 2020—awarded to the top-four finishers at the series end. “We’re as healthy as we’ve been in a really long time. This is probably the toughest selection we’ve had since Rio,” said head coach Tait. Captaining the squad will be veteran Ghislaine Landry who leads the points-scoring race this season with 106 points through the first three events. Joining her at the top of the rankings is Bianca Farella who sits second in tries scored with 18 to date—only two behind New Zealand’s Michaela Blyde. Making her return to the lineup for the first time since Rio 2016 is Quebec City-native Karen Paquin. Coming back from injury, Paquin returned to action for the first time in March on a midseason development tour with the Maple Leafs. Kitakyushu comes just ahead of Canada’s hometown series in Langford, BC on May 11-12th, a tournament that has recently been renewed into the 2019/2020 season. Canada will face off against Spain, China, and Australia on day one of competition in Pool B. Fans can watch every minute of competition LIVE on CBC Sports.